@Mushyrulez: Haha, ya that last sentence is poorly worded. 😉 “the same energy as” should go in their somewhere or just drop the TNT and go with megaton, which of course implies TNT, in terms of the explosive power, but makes the sentence meaning more clear. Interesting,If someone could explode (convert) the whole mass of earth than it will be like a supernova.. I have computed as well such conversion of matter to energy with no waste (like the annihilation of matter and anti-matter). I used an ideal 55kg person whose body is divided equally by matter and anti-matter (so to commence an annihilation). I preserve here the Law of Conservation. I converted the weight 55kg to mass in order to use Einstein’s E=mc^2 and I got m=5.612 kg. I arrived at E= 5.04×10^17 J. 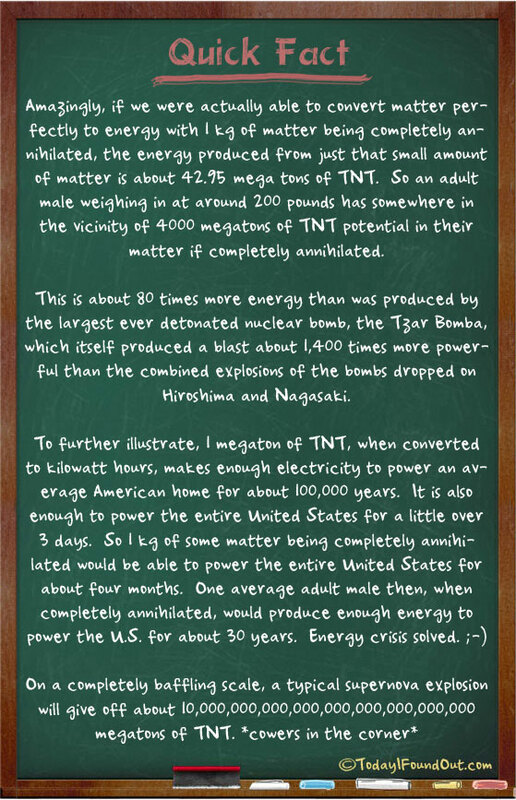 This energy would be equivalent to 2.4 Tsar Bombas where the energy of a Tsar Bomba is equal to 2.1×10^17. I also converted it to watt hours (1J=2.77778×10^-4) and I got 140 terawatt hours. As of 2008, the hourly global energy consumption is 15 Twh so I presume that this 55kg person can power the world for 9.33 hours. You would need 938-940 persons of weight 55kg to be sacrificed in order to provide a year for the world’s energy consumption. And I also checked if your right with a 200 pound or 90.718474kg adult sufficiency in sustaining energy consumption for 30 years. As of 2009, US yearly electricity consumption is 1.4×10^19J so divide it by 8760 hours to get the hourly consumption of 1.6×10^15 J. You checked his math wrong and I quite honestly don’t know how you didn’t catch your mistake. You plugged in mass where weight or force goes, then proceeded to solve for mass. You began with the mass already so that was unnecessary. Then you finished off with 21.67 days and concluded that was the same as the author’s 30 years, unless that was supposed to be sarcasm. In any case you’re way off. I’m as dumbfounded as Kevin as to why you didn’t see your mistake. You substituted the mass of 90.718474kg into W as 90.718474N. Weight is not mass. You should try to actually understand what you preach before you say it. Thanks, Kevin and novo! I’m really surprised in rereading my comments here and discovering my regretful stubbornness then. I think I have considered that time that all weights are not expressed by weighing scales in Newton but in kg and pounds (which are units for mass), and that things are measured in Earth. Indeed, as both of you said, I have re-expressed the 90.71… kg as 90.71… N (thinking that weight is erroneously rendered in mass units) and calculated for mass. So yeah, my reasoning may be valid but my calculations might still be wrong. Nevertheless, I honestly appreciate both of you for pointing out such mistakes, not only for my sake but for those readers who might happen to pass by this page! So if Trump was turned into energy, he finally would make a useful contribution. Is this still widely accepted as true in 2019? Because I’m researching this and I’m getting so many conflicting ideas.. In fact this is the only blog I found that directly says that matter has immense amounts of energy bound up inside it, everyone else talks in circles someone please just tell me straight is this still right or is there a different view on this topic now. I’m not a scientist obviously.